Presuppositional apologetics, if it is really based on mere presuppositions, is not sound reasoning. My presuppositions are assumptions that I made, then forgot that they were assumptions and now I merely view them as part of my imagined false-reality–my worldview. 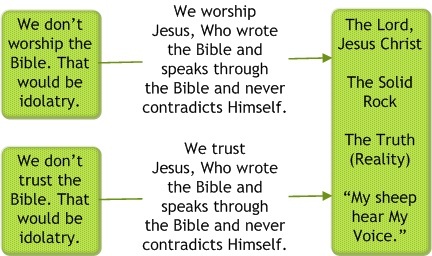 (read more about presuppositional apologetics) However, most people who think that they are using presuppositional apologetics are actually using revelational apologetics. They are simply speaking of their experiences of being led by Jesus Christ, the real Person. They are living by the Life of Christ Who is in them. That’s what revelational apologetics is. Revelational apologetics is more honest than straight presuppositional apologetics. Revelational apologetics doesn’t have problems with circular reasoning or any other logical fallacy. Revelational apologetics is sound, based on the Rock of Revelation, the Rock, Christ Jesus. 2 Peter 1:16 “For we have not followed cleverly devised fables, when we made known to you the Power and Abiding Presence of our Lord Jesus Christ, but were eyewitnesses of His Majesty.” 1 Corinthians 2:2 “For I determined not to know anything among you, save Jesus Christ, and Him crucified.” 1 John 1:1 “That which was from the beginning, which we have heard, which we have seen with our eyes, which we have looked upon, and our hands have handled, of the Utterance of genuine and absolute fullness of life;” Revelational apologetics is also simple. Lies and tactics of ungodly people are complex, since people can rationalize anything. We simply speak of our experiences with Christ. This doesn’t mean that experience trumps the Bible. The Bible is a large part of our experience with the Living Christ. He is the One Who Speaks to us through the Bible. In fact, Christ is the One Who tells us that the Bible is His Word without error–His revelation is the only way we could know such a thing without circular reasoning. And His revelation is the only way anyone can understand what He is saying through the Bible. For instance, Atheists may read the Bible while giving Satan a high degree of control of their minds, so they can’t understand what they are reading. Christ-followers have Christ dwelling within. They are the visible Christ in the Earth–the Body of Christ that is joined in submission to Christ the Head, Who is in Heaven. Your life as a Christian should make unbelievers question their unbelief in God. Revelational apologetic is the act of allowing the Christ who is hidden within you to be seen. It is letting the love of God be shed abroad in your heart, your innermost mind, by the Holy Ghost. He is seen in how you think, speak, and act. You may have to answer some questions. You may have to ignore some rude remarks. But you must be Christ to those around you. If you become upset, angry, argumentative, abusive, or any such thing, you manifest your own flesh. But the ministry, Christ within you, will get the blame. And you will do great damage to what Christ is doing if you take on the characteristics of the ungodly while proclaiming the Name of Christ. The difficult part of revelational apologetics is that the person using revelational apologetics must have a real relationship with Christ. The person using revelational apologetics cannot be serving a theory or theology of Jesus Christ. The person using revelational apologetics cannot have rationalized faith in a rationalized Jesus. He or she must be actually following Jesus, and Jesus must actually be leading him or her. At the same time, every Christ-follower is learning to hear Christ’s Voice and to respond in submission to Him. Don’t be discouraged by the dullness of your own spiritual hearing. Don’t get over-confident or prideful or you will fall. Don’t add to His Words. Don’t exaggerate your experience. Always have a humble mind and remember that you have brothers and sisters in Christ who also have real experiences with Christ. The Body of Christ is a multi-membered Body, and each of us only receives part. We don’t have significance alone, and we can easily go astray because a part of the truth, when it is believed to be the entire truth, is a lie. Read 1 Corinthians 12-14 to understand this further. There are some who are using, “God is still speaking,” as a marketing ploy for their denomination and as an excuse for their anti-biblical teachings. This is the main fear when considering whether to believe that God speaks, though whether or not there are false prophets and false teachers has no impact on the reality of whether or not Christ leads His people. It seems that the argument goes something like this, “The human mind can be easily deceived (true premise), so we can’t trust God but must trust the human mind to understand the Bible (false conclusion: it does not follow). We do need to realize that if we know anything (the things God has made real to us), we don’t know them as we ought to know them. We must be open to correction from God directly and also from other followers of Christ. It’s not about proving that God exists. We know that Atheists know about God. God is telling us that He reveals Himself to them through the things that He has created. But they refuse to acknowledge Him. So, our conversations with unbelievers are never about proving that God exists, no matter how hard some people work to turn everything into an ugly debate. (read more) It’s not about winning an argument, so don’t be drawn into that. It is about manifesting Christ. That means kindness, telling of your experience with Christ, and inviting them to know Christ. It means that you will probably have to tell them some rather upsetting news about their need for Christ because of their fallen nature and sin condition. Every attack against the Bible, against Jesus Christ, and against the creation account and the flood account in the Bible is based on made-up stories, flimflam, irrational thoughts, outright lies, arbitrary assumptions, or some combination of these. Christians ought not to be ashamed of Jesus Christ Who lives in them and guides and directs their lives. Of course, many Christians don’t pay enough attention to that leading. They fail to acknowledge Him. However, a Christian who is walking in the Spirit and keeping pace with the Spirit can use revelational apologetics. Ungodly people usually think that they are being perfectly logical. Most of them are unaware of the problem of paradigms. Concepts outside their paradigms seem, to them, to be weird and insane. A paradigm is a worldview or fake-reality. Paradigms are not reality, but they seem more real that reality itself. Everyone has one–even Christians. They are based partly on observation but more on assumptions, lies, stories, and irrational thoughts that have become presuppositions. And they act to filter out any truth that conflicts with the paradigm. The human mind gets closure by filling in the gaps and not thinking about the internal inconsistencies of the worldview/paradigm. The human mind is deceptive and desperately wicked to the point that we can’t know our own minds. If God were not to speak to each of us individually, there is no way that anyone could possibly know that the Bible is the Word of God without error. If any person claims that God does not speak to them but that the Bible is the Word of God that person is forced to use circular reasoning. Plus, such a person would have to deny the Bible, since the Bible says that God speaks to us. 1 Corinthians 12:2-3 2 You know that when you were pagans, you were led astray to the mute [incapable of articulate speech] idols, however you were led. Therefore I want you to know that no one who is speaking by the Spirit of God says, “Jesus be cursed,” and no one can say, “Jesus is Lord,” except by the Holy Spirit. 1 Peter 4:11 If anyone speaks, let him speak as the very mouth of God…Luke 10:16 He who hears you hears Me; and he who despises you despises Me; and he who despises Me despises Him Who sent Me. Proverbs 30:5-6 Every Utterance of God is refined; He is a shield to those who flee to Him for protection. Don’t’ add to His Words, lest He reprove you, and you be found a liar. John 16:13 However that may be, when He, the Spirit of Truth, has come, He will guide you into all Truth: for He shall not speak separately Himself; but whatever He shall hear, that shall He speak, and He will show you things to come.Romans 8:26 Likewise the Spirit also helps our weaknesses, for we don’t know what we should pray for as we ought, but the Spirit, Himself, makes intercession for us with groaning which cannot be uttered. Numbers 12:6-8 6 And He said, Hear My Words now: If there is a prophet among you, I Jehovah will make Myself known to him in a vision, and will speak to him in a dream. My servant Moses is not so, who is faithful in all My House. With him will I speak Mouth to mouth, in a way that can be seen, and not in something that must be guessed, and he shall look at the form of Jehovah. Why then weren’t you afraid to speak against My servant Moses? 1 Chronicles 16:30-34 Dance before Him, all the Earth: the world also shall be stable so that it is not moved. Let the heavens be glad, and let the Earth rejoice, and let them say among the nations, “Jehovah reigns.” Let the whole sea roar. Let all the fields rejoice. Then the trees of the wood shall give out a ringing cry of praise and exultation at the Face of Jehovah, because He comes to judge the Earth.